Rosalind Buckland Librarian, Ripley St Thomas CE Academy, Lancaster is one of three ‘exceptional’ librarians on the 2012 SLA School Librarian of the Year Honour List. Here she selects her book of the year for Books for Keeps. I am Grimalkin by Joseph Delaney is the ninth book in the Wardstone Chronicles. Grimalkin is a witch assassin: an awesome combatant, swift on foot and lethal with a blade. She is feared wherever she is known and is one of the most terrifying, and therefore most popular, characters in the compelling Spooks series. When Grimalkin first encounters Tom, whose destiny it is to become apprentice ‘spook’ to Master Gregory, he is her adversary, but for reasons of her own, to avenge the brutal killing of her son, Grimalkin chooses to join forces with Tom and the Spook in order to attempt to bind the Fiend. But to successfully do so the Fiend’s severed head must forever be kept in her possession, at all costs and no matter who desires it. The Wardstone Chronicles are a rare find, they posses that invaluable ingredient - an appeal to both boys and girls. That this series is currently being made into a Hollywood film with Jeff Bridges and Julianne Moore will no doubt serve as a further endorsement. 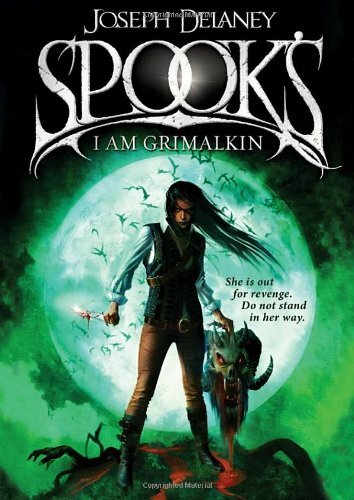 If you were to ask any Spooks fan to choose their favourite character Grimalkin will invariably be top of the list. She is scary yet mesmerising and it is no surprise that she should finally be cast in a major role; but thank goodness for Tom and the Spook that on this occasion she is on the side of the good.